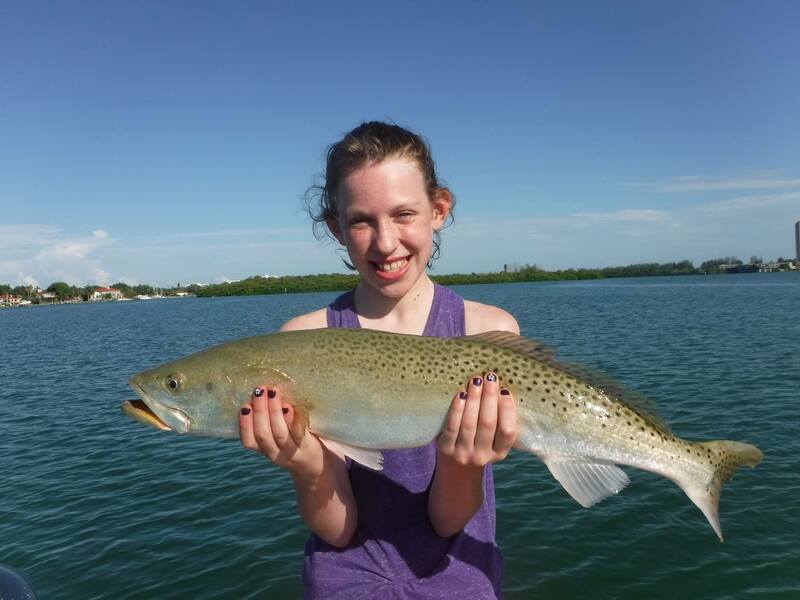 Creek fishing is productive in Sarasota, Florida! Finding fish in January can be tough, especially after a cold front that has the water temperature around 50 degrees. Cold water will send fish scurrying for deep water. It will also send them back into creeks, rivers, and residential canals. The water can be as much as ten degrees warmer in the back end of canals. I have found that working these creeks and canals to be a very reliable winter pattern. The best creeks and canals will have varying depths with some deeper water (6’-10’), along with cover such as mangroves, oyster bars, and docks. 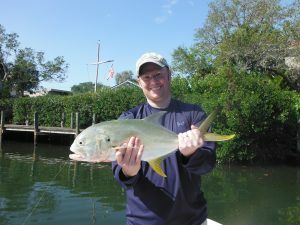 Bowles Creek, Hudson Bayou, Whittaker Bayou, Phillippi Creek, South Creek and the Grand Canal on Siesta Key are all good places to fish. These will hold a variety of species including snook, redfish, sheepshead, speckled trout, black drum, jack crevelle, flounder, ladyfish, and even juvenile tarpon. Live shrimp are extremely effective when creek fishing Sarasota. Fish activity has slowed down and so will the successful angler. One of the best situations is to fish a deep hole in a creek on a low, incoming tide. The low water will congregate fish in the hole; it can literally be “fish in a barrel”. A live shrimp hooked on a #1 live bait hook with a short piece of 30 lb shock leader and just enough split shot to get the bait to sink slowly to the bottom is the simple, but effective rig to use. Be patient and allow the scent to permeate the area, again, these fish will be bit more lethargic. A few pieces of diced up shrimp tossed into the water as chum will often times get the bite going. Artificial lures can be very productive, too, and they offer the advantage of allowing an angler to cover a lot more water than when using live bait. The best technique is to drift with the tide while casting to likely looking structure such as docks and mangrove shorelines. Often times the fish will be right out in the middle “sunning” themselves, so cover the area thoroughly. I find that this pattern works best later in the day when the tide is coming in and the water has warmed up a bit. Shallow diving plugs such as the Rapala X-Rap are my personal favorite lure to use in when creek fishing Sarasota. My clients have caught some big Sarasota snook and jacks using this technique. Simply cast it out and twitch the rod tip sharply and the lure will dive down several feet. Pause a moment, then repeat. Often times the strike will come as the bait sits there motionless. These lures can also deadly while trolled, so as you idle along let one out a hundred feet behind the boat. I have fooled many a big jack crevelle when trolling Rapalas! Soft plastic baits work very well, too. Scented lures such as Gulp! have the advantages of both lures and bait. Darker colors such as rootbeer and “golden bream” seem to produce the best, and a contrasting white or chartreuse tail can sometimes help, too. Slowly bouncing the bait along the bottom will usually produce the most fish. These lures will catch more species than plugs will. Creek fishing Sarasota have saved the day for me on numerous occasions when the weather was less than ideal. One trip in particular comes to mind. I met my clients around noon and it was cold and windy. We almost cancelled the trip but decided to grab some live shrimp and give it a try. As we idled north, I knew that I needed to find a protected spot to fish, so I ducked into Phillippi Creek and anchored up on the edge of a five feet deep hole. I baited up both rods with live shrimp and cut up a couple more and tossed the chum into the hole. The first bait wasn’t in the water for a minute when line stated screaming off the reel! It turned out to be a four pound sheepshead and we caught another dozen sheepies of varying sizes along with a couple of redfish. The action slowed and I pulled the anchor. 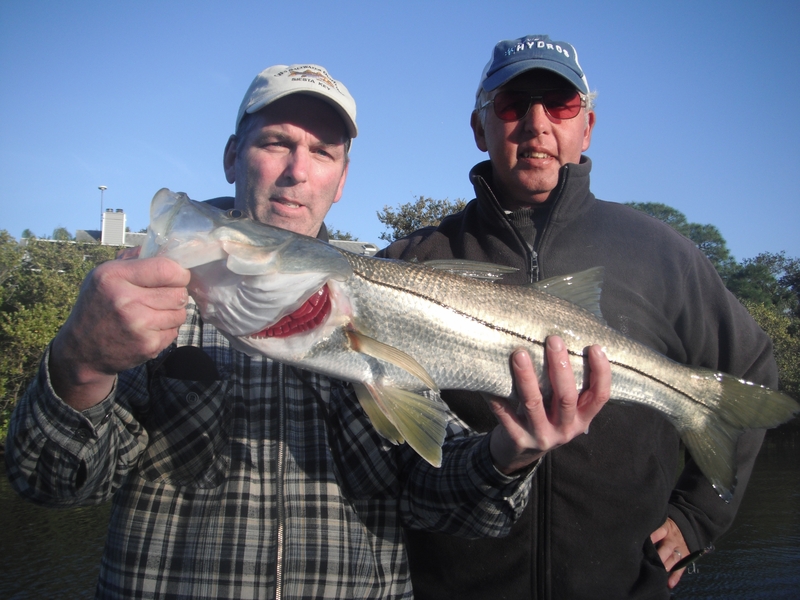 We drifted up the creek casting plugs and my clients caught several snook between 18” and 24” along with a pair of five pound jacks. It was a great trip that nearly did not happen. Once again, Phillippi Creek saved the day. Don’t be afraid to go “Up a Creek”!